Access MBA and Access Masters regularly organises informative events online, in which website visitors can freely participate. 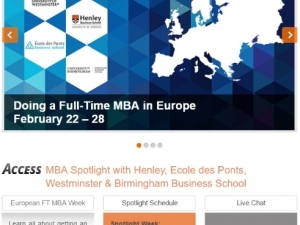 The Access MBA and Access Masters websites propose online, week-long “rendez-vous” focused on a specific topic. Previous Spotlight session titles included MBA & Entrepreneurship, and Doing a Full-Time MBA in Europe. Each session gathers articles, interviews, videos, an audio discussion and a live chat with business schools. 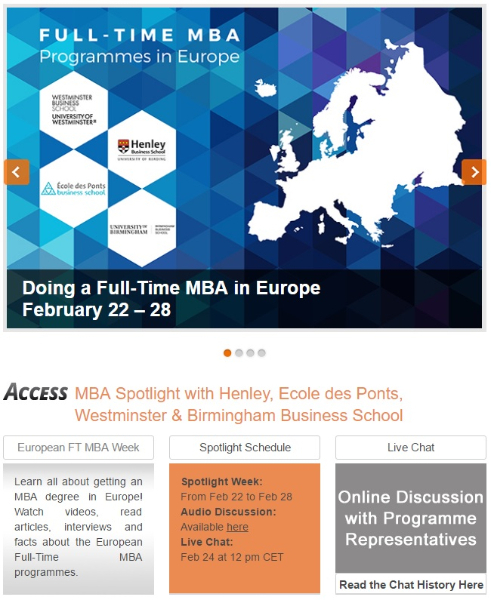 Each Live video session is one-hour long, and broadcasted in real-time on the Access MBA or Access Masters websites. Unlike the Spotlight events which are topic-specific, the Live session is composed of a video interview with one business school. During each session, users have the opportunity to address their questions directly to the representatives via chat and email, and immediately see and hear the response.